Vivekananda Kendra Chinchwad had organized a blood donation camp as every year. 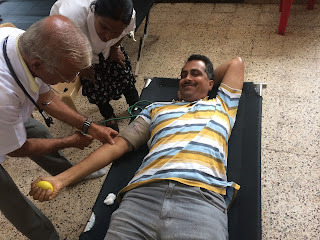 Around 100 people had come to donate blood for this social cause. ​they were first tested for Hemoglobin count and BP and from them 55 people successfully donated blood. Blood collection was done by PSI Blood bank Kharalwadi, Pimpri. Every blood donor was gifted with a scented plant to spread awareness of green and clean environment. ​Next blood donation camp is planned in month of November on ​ 19/11/2017 on the eve of 102th birth anniversary of Shri Eknathji the founder of Vivekananda Kendra Kanyakumari.